← Are the Saudis behind the Syrian Chemical Weapons attacks? While the US President ponders whether he should initiate targeted strikes on Syria, church leaders worldwide are united in their opposition to violent foreign intervention. As far as I can see the number of Christian leaders on the planet who support armed foreign intervention in Syria number exactly zero! Certainly when it comes to Syria and her neighbours, the voice of the church is unambiguous and clear – for God’s sake don’t kill more Syrians! There are other ways! While there are no shortage of mockers who say that dialogue will not achieve anything, the truth is that it has not been tried! Accounts such as this one, along with thousands of others, and photos, and now especially, the videos from what is presumed to have been an attack of chemical weapons, have the international community calling more urgently for a change in Syria after more than two years of conflict. But as the United States and others consider plans for possible military intervention, Church leaders from Syria, and the Vatican as well, are reiterating the call for dialogue. Caritas Internationalis today also said “peace talks” are the “only option” in Syria. “We urgently need peace talks as the only option for an end to the tragedy in Syria,” he said. Caritas Internationalis Secretary-General Michel Roy said, “The Syrian people don’t need more bloodshed, they need a quick end to it. They need an immediate truce. Scaling up military intervention by foreign powers will simply widen the war and increase the suffering. “The last decade bears witness to the tragic consequences of military intervention in Iraq, Afghanistan and Libya. US President Barack Obama was speaking today of “limited and narrow” action in Syria, though he said the decisions are still being weighed. Over a year ago, the president said that the use of chemical weapons would call for a response. 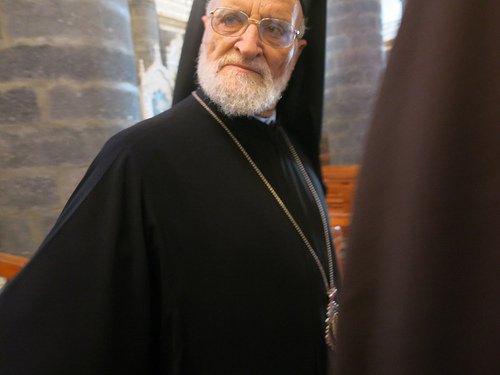 The Melkite Greek Catholic Patriarch of Antioch has also said that in spite of the dire situation in Syria, reconciliation initiatives are still viable and should be the top priority for all countries concerned with the crisis. Gregorios III of Damascus said this Tuesday in an interview with Catholic charity Aid to the Church in Need. The UK Houses of Parliament on Thursday heard the Patriarch’s appeal, as Baroness Caroline Cox of Queensbury quoted him, saying that armed intervention by the West in Syria would only fuel violence and unrest. The Parliament on Thursday voted against possible missile strikes. In the Tuesday interview, Patriarch Gregorios expressed his doubts about being able to determine who was behind the chemical weapons attack of Aug. 21. “The Americans have been fueling the situation for two years,” he declared. He condemned as immoral the flow of arms into the country. In a statement Wednesday, the Latin Patriarch of Jerusalem, Fouad Twal, asked “by what authority” the US would launch a strike on Syria. “Is there a need to increase the number of deaths, now over 100,000?” Patriarch Twal said. The patriarch also warned of the consequences of a possible attack on the entire region. These were concerns also expressed by Chaldean Catholic Bishop Antoine Audo of Aleppo, who is also president of Caritas Syria. Even with strong voices calling for negotiations, the direness of the situation can hardly be underestimated. The Caritas Internationalis spokesman suggested to ZENIT that the only way to bring those involved to a point where they can negotiate without violence, is prayer. In that light, those doing the most to help Syria might be the people who started the week of prayer today, and others such as residents at the Monastery of St. James in Qarah (a city between Damascus and Homs). The ecumenical community of that monastery is dedicated to prayer; their leader, Fr. Daniel Maes, told Fides that, “aware of the power of prayer and faith in the Providence of God,” the priests and nuns will have all night Eucharistic Adoration. This entry was posted in Article, syria news, syria now and tagged Father Dave, Gregory III Laham, NO, obama, pope francis, syria, US, ZENIT. Bookmark the permalink.